Johns Island Bluebird Trail – Club member obtain, erect, and maintain at least one bluebird house on their property to encourage growth of the local bluebird population. 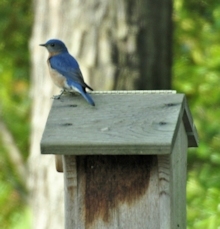 Club members who do not have a habitat for a bluebird house will sponsor one at an alternate location. Club members developed an educational exhibit, which includes a map of Johns Island and surrounding areas, reflecting the locations and number of bluebird houses on our Bluebird Trail. This exhibit is displayed in public areas around the community to showcase the bluebird and its habitat and highlight what is needed to attract and protect it. This educates and encourages residents to participate with a bluebird house of their own as we continually track and record new bluebird house locations on the display map. Certified Back Yard Habitat - MGC strives to have 100 percent participation in the National Wildlife Federation Certified Backyard Habitat Program. All but our newest members are certified and we work with our new members to become certified as soon as possible. 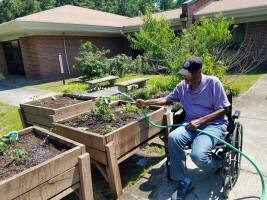 Gardening Therapy for the Elderly – MGC conducts quarterly workshops for residents of Johns Island Health and Rehabilitation Center. 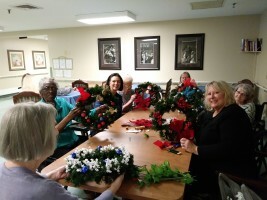 Residents have participated in decorating Noel wreaths for their doors, making bird feeders to hang outside in the atriums, planting seeds to be transplanted and installing the seedlings in raised beds at the center. This summer produced melons and peppers as well as zinnias. 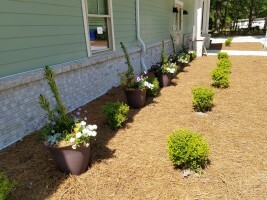 Civic Beautification – MGC adopted five containers to plant and maintain at the Barrier Island Free Medical Clinic on Johns Island. The clinic provides free medical care to eligible residents through volunteer doctors, nurses and support from the community. 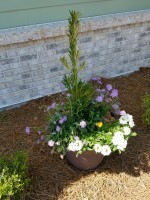 In April, the clinic moved into its brand new building.